I can honestly say I've never been anywhere stranger in my life. Tokyo is like another world. Walking around, Beau and I are pretty much the only white people. I'm not really sure what I expected, but everyone here is, well, Japanese. Getting around is a nightmare. The address system is meaningless, and not just to a foreigner. We, along with nearly every Tokyo native, seem to be consulting the subway maps at every stop, not quite sure where we are going. Cab drivers are equally clueless, unsure of even the most touristic sites like the Meiji Shrine. We have probably spent the majority of our time here looking for things. All that being said, the food is incredible. Even the snacks we've picked up at the convenience stores are delicious. The Pocky, Joy Packs, and Royal Milk Tea really put Snackwells, Cheetos, and Mountain Dew to shame. And the sweets are no exception. Tottering around the food halls at Mitsukoshi and Isetan was a revelatory experience. A new standard for food halls has really been set, and I just don't think Harrod's or Le Bon Marché will really measure up anymore. Have a hakering for octopus balls? You've got it. More interested in sampling an array of Sake? Mitsukoshi's the place. Want to gorge yourself on tasty sweets in the most lovely packaging you'll ever see? Take the escalator to the basement of Mitsukoshi and prepare to be dazzled. Across the board, every dessert here is really beautiful. They pay as much attention to appearance as they do to taste. And they really deliver on both accounts. So, in keeping with their mantra of form and function, I give you this knockout cake. Preheat oven to 350. Butter two 9-inch cake pans and line with parchment paper. Butter parchment paper. In a medium bowl, whisk together flour, baking powder, and salt. In the bowl of a stand mixer, cream together butter and sugar. Add the eggs, one at a time, beating to combine. Beat in dry ingredients in three additions, alternating with buttermilk. Stir in 1 tablespoon rosewater. Divide batter between prepared cake tins. Bake for 30 minutes, until golden and a toothpick inserted in the center comes out clean. While cakes bake, cream butter in the bowl of a stand mixer. Add powdered sugar 1/2 cup at a time until incorporated. Beat in milk and vanilla extract. Scrape beans from split vanilla bean and beat to incorporate. Once baked, let cakes cool completely on a wire rack. 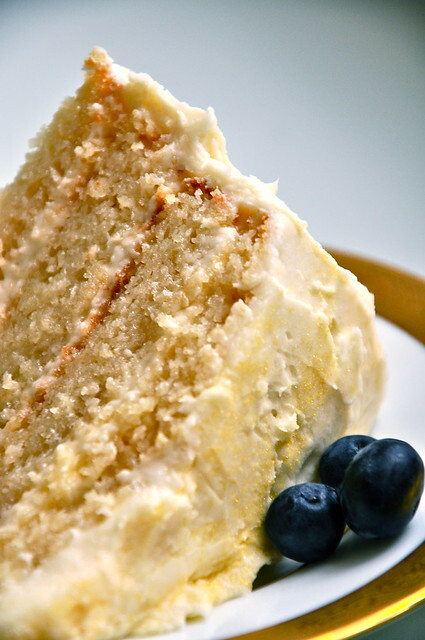 Remove cakes from tins and slice in half using a serrated knife or cake leveler. Stir together remaining rosewater and simple syrup. Place a single cake round onto cake plate and brush top with rosewater syrup. Add a thin layer of frosting over syrup and top with another layer of cake. Repeat until all layers have been used. 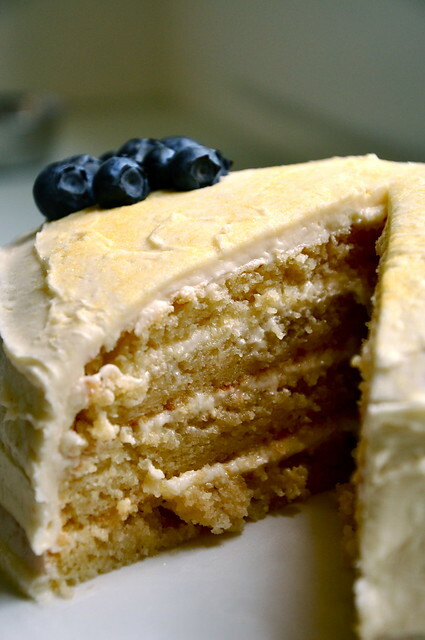 Coat the cake in a thin layer of frosting to create a crumb coat and place in fridge to chill for 30 minutes. 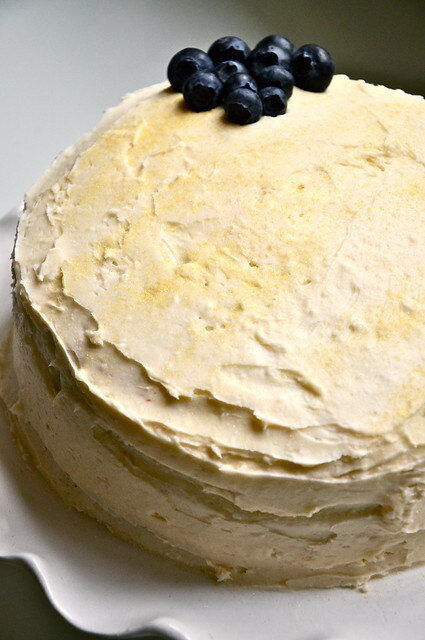 Decorate cake with remaining frosting and dust with luster dust. 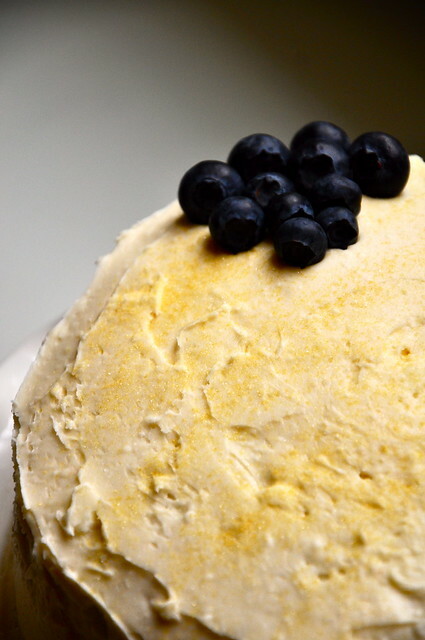 Roll blueberries in luster dust and scatter over cake.